Once I decided to let my gray hair grow out, I did what most typical 21st century people do: I hightailed it over to Google to search for information. 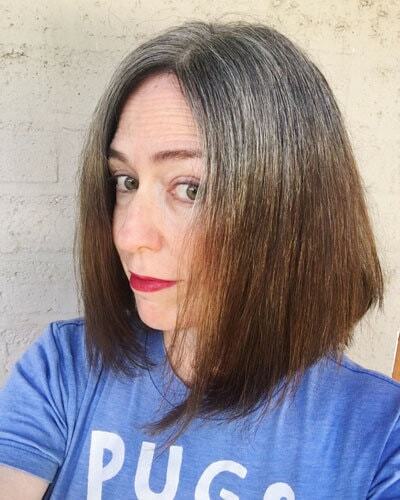 That’s how I found How Bourgeois, Lauren Stein’s great blog about (among other things) her gray hair journey. Lauren embraced her grays at a relatively young age due to an allergic reaction to PPD. 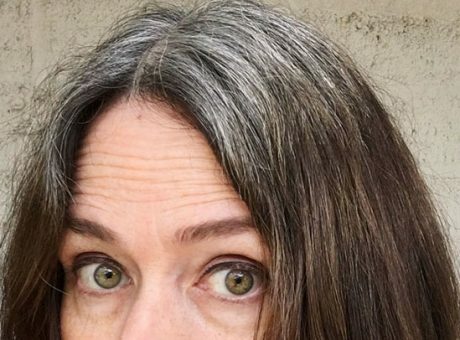 She rocks her beautiful gray hair, and her sparkling personality shines through her blog posts. Her blog gave me (and many others) the confidence to ditch the dye and start the transition process. 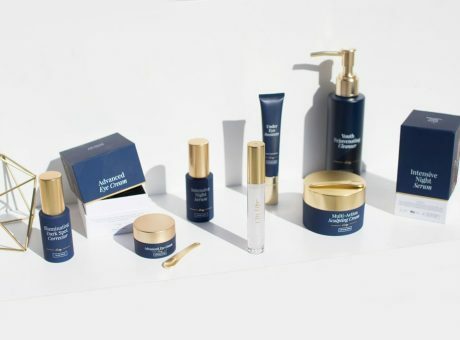 What Made You Decide to Start Your Own Product Line? 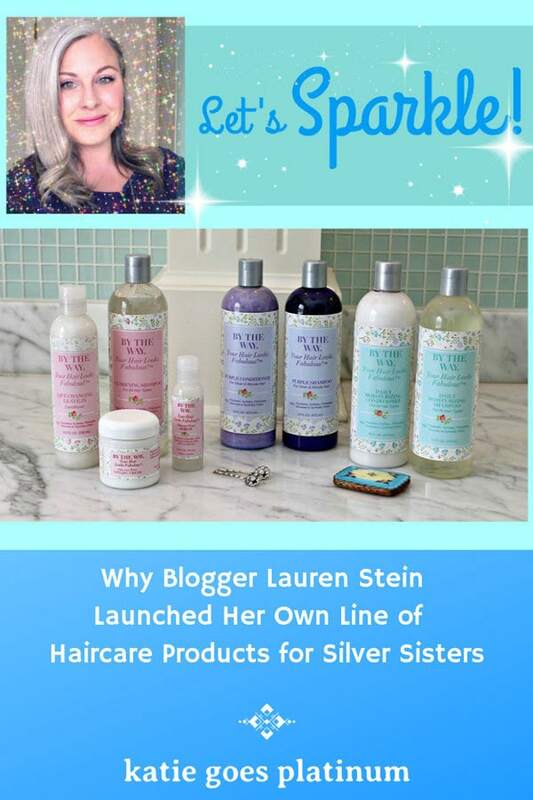 I can tell you EXACTLY what made me decide to start my own line – I searched for YEARS for haircare and styling products that took all of the needs of my gray hair into account, that wouldn’t turn my white hair yellow, that were at the very least paraben and sulfate-free (let alone all of the other harsh chemicals) AND were reasonably affordable! I just couldn’t find those four criteria, all in one. There are many nice brands out there that cater to people who want to keep brassy tones at bay in their blonde and gray hair (hence “purple” products), but I’ve yet to find any true, gray-hair-specific lines. How Was The Process? It Must Have Been A LOT of Work! Thank you. It has been a long process, more than two years. We wanted to do everything correctly, not cut corners, so we didn’t rush anything. I need to say that I am incredibly lucky to have my husband/BFF as my partner in this. I truly could never have launched The BTW Co. without him. Jon has been running the business and manufacturing end of the company, a lot of the marketing and communications as well. Jon’s work background and experience have been a huge help, as I had no idea where to begin! Initially, I started by coming up with a set of “dream products.” I thought about the needs of gray hair, what women and men had been saying on the gray hair groups and pages that I belong to. I took into account the emails and comments that I’ve received through my blog over the years and tried to really come up with a set of characteristics that my products needed to have! Once we had a clear idea of WHAT we wanted to make, our own personal guidelines and convictions, then we started searching for WHO could formulate and produce our products. That was more difficult than I had imagined. It wasn’t the easiest thing to find formulators in the beauty industry who were super thrilled about using natural ingredients. Most were open to it, but there was push-back due to the additional cost and time that it would take to source and use these ingredients, compared to more readily available synthetics. We traveled around for about a year, interviewing companies, touring their labs and manufacturing facilities. In the end, we found a fabulous Canadian company who “just got it,” and understood completely WHY we wanted to cut out harmful chemicals. They supported us all the way! After that, it was all about getting the formulations right. A version would be made and we’d have real Silver Sisters and people of all hair types and colors try out the products. Each detail and characteristic of every item was tested, evaluated, recorded and tweaked. We went through multiple runs of every product to get things just right. Then came the packaging (which my Mom designed!) and finding the best shipping deals we could for our customers. We have a warehouse now in Seattle that is great and can ship right out to you, all over the world! Tell us about the ingredients you use (or the ones you avoid) – How are they beneficial for those of us who are going gray or already gray? Because many of my readers have ingredient sensitivities like my own, we care a lot about making our products more naturally-derived. Every product in our line is free from Phthalates, Sulfates, Parabens, Silicones, and Synthetic Fillers. One of the reasons that I decided to stop coloring my hair, in addition to an allergy to the chemical PPD in most hair dye, is because I wanted to avoid as many synthetic ingredients as I could in general. I was touching up my gray roots every 3-4 weeks, and I realized how many chemicals I was regularly applying to my hair and skin! It just felt right for me to move in a more natural direction. So, we took out everything that was harsh and not natural and replaced them with more gentle, healthy ingredients. Ingredients that also worked well with the moisture and TEXTURE needs of gray hair! 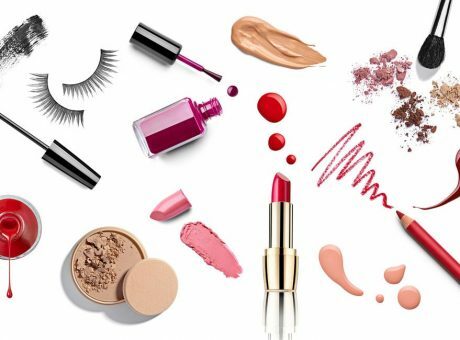 Ingredients that wouldn’t dull your sparkly whites or yellow them. For example, we replaced silicones, which can really build up and turn white hair yellow, with natural oils from different plants. Specific combinations that would help with texture and shine, but not weigh down the hair. Lots of great swaps for conventional formulations into newer and more natural! I see your products are cruelty-free (yay!). What made you decide to go in that direction? I love this question!!! It makes me so happy that more and more, consumers are asking for cruelty-free products. It warms my heart. I have also been a vegetarian for most of my life. Jon and I believe that the testing of beauty products on animals is cruel and unnecessary. ALL of our items have gone through very thorough laboratory testing (not on animals). Each and every ingredient and the completed formulations themselves have had to pass rigorous testing. Katie! Me too! I was shocked but THRILLED to find that my hair’s texture, and especially the softness IMPROVED vastly when I stopped coloring my hair! I was so surprised and never expected it. My best guess about what happened is that the years of coloring my hair with dye and henna really just dried it out. Even the “more natural” dyes stripped a lot of moisture. 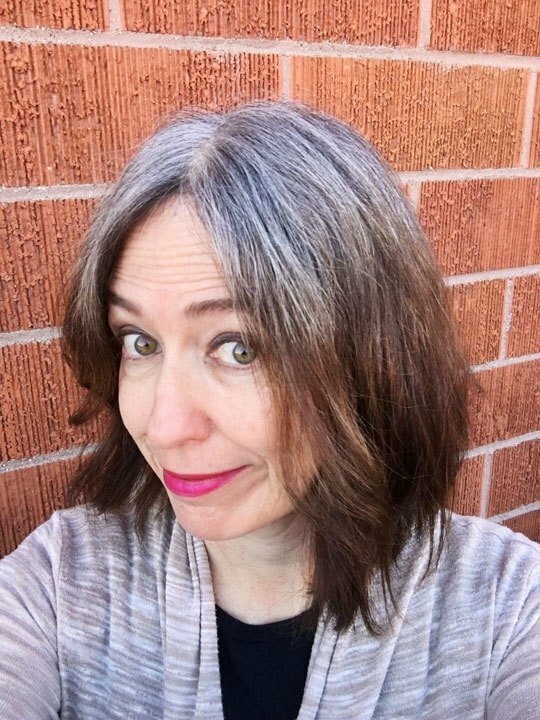 When I stopped dyeing my hair, yes, some of the gray coming in was a little wild and had a mind of its own, but the overwhelming majority of my new hair growth was soft and shiny! It took some time to figure out the right products, tools, and techniques to dry and style my hair, but once I did, I was able to work with any coarseness and make my hair look just fine. What’s next for you? 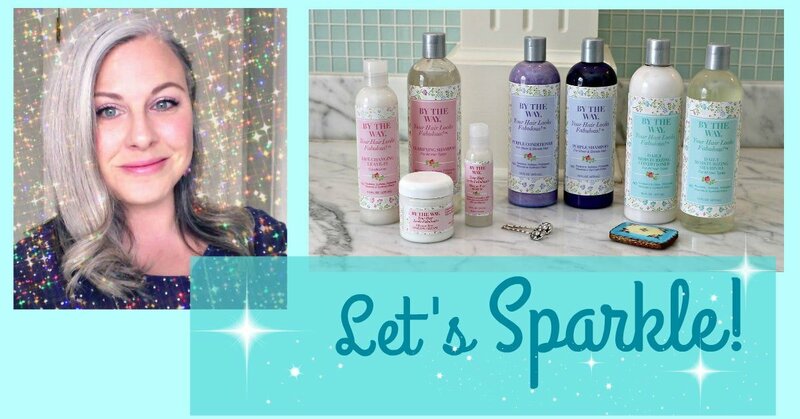 You’ve got your great blog, now your haircare product line – you are on FIRE! Aww, thank you. Oh man, what’s next? A nap! 😉 Just kidding. I find myself equally busy as a Mom these days, but as my son has become older, I would really like to grow the career side of my life as well! I already have my eyes on an additional styling product. That product is something that I am in love with and hope to be able to have formulated and produced for our second production run. Also, one thing that I would love to offer on our site is accessories and gift packages for the woman who is growing out her hair. I spent a lot of time searching for and experimenting with bobby pins, barrettes, headbands, hats, scarves, makeup, etc., that would help brighten up my look and spirits during the tough transition. I want to offer fun pick-me-ups for my fellow Silver Sisters because I know just how much that can be needed. Growing out our hair and daring to show the world of true color is a really emotional journey!!! In preparation for this interview, Lauren and Jon sent me some of their products to sample, and I was very impressed! This morning, I washed my hair with The BTW Co.’s Daily Moisturizing Shampoo and conditioned it with their Life Changing Leave-In Conditioner. The packaging is very pretty, and both products are pleasantly scented (the scent is not overpowering, which is a big plus!). I was happily surprised at how light the leave-in conditioner is – so many of them are SO thick. But this one is light AND it worked! 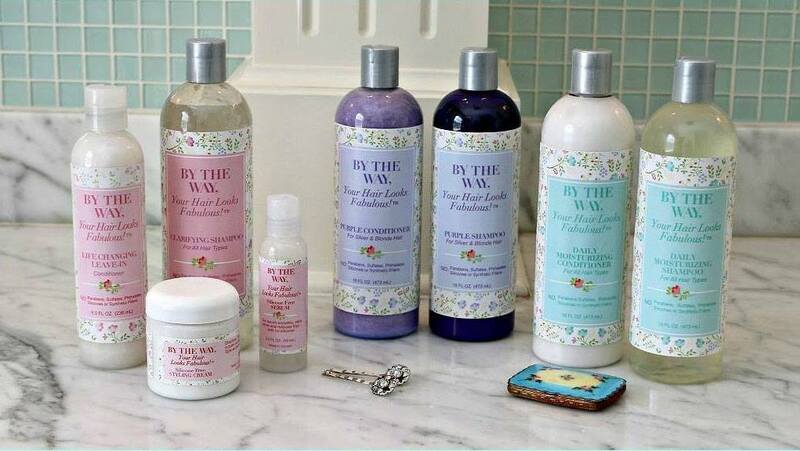 I also have samples of the Daily Moisturizing Conditioner and the Silicone-Free Styling Cream. I only wash my hair twice a week, so I will be back mid-week to report on those two products. Shop Here: The BTW Co.
Use coupon code KGPBTW for 20% off of your first order!